It was surprisingly simple and easy to make. The hardest part was going to Bristol Farms and shelling out (pun fully intended) $24.99 per pound for the soft-shell crabs. Four crabs basically equaled one pound. Yikes! At home, I heated the olive oil and, instead of using the three or four cloves of garlic as called for in the recipe, used the Korean equivalent: eight cloves. I cooked the slivered garlic gently in the olive oil and added about a tablespoon of crushed dried red pepper (again, a Korean adaptation! ); when the garlic was cooked but not browned I added the four beautiful little soft-shell crabs. I covered the lid on the pot then put some water on for boiling the pasta, which I chose to be linguini. I ended up adding the parsley and one diced Roma tomato for color. I didn’t add any salt (my family has a tendency towards high blood pressure!) but the crabs themselves had a bit of salt in them from living in the ocean. After about 15-20 minutes of cooking, the crabs were a brownish-red in color, and their aroma was heartbreaking. Their juices had run out and emulsified with the olive oil and garlic. Beautiful. Overall, the whole process–with prep time–took about 30-35 minutes. I served the pasta with a sliced baguette and, to drink, the Touraine sauvignon blanc from François Chidaine. It was crisp, bracing, with nice acidity and subtle minerality but with a surprising burst of melon and citrus fruit that ended with a bit of straw or grass. 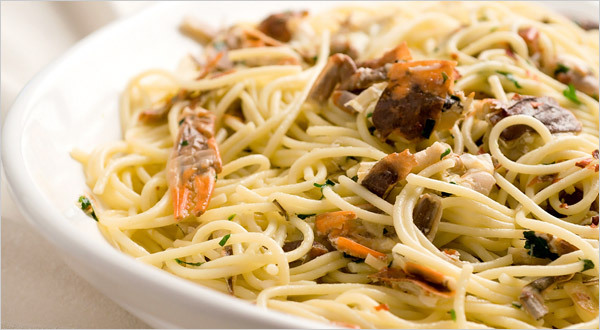 It was very, very good with the pasta, which was infused with the rich, full taste of the sea and the gentle bite of cooked garlic. Overall, a wonderful pairing. Sounds delicious. Although I have to say that a BC Spot Prawn could smoke a crab any day!